Well, just a week after we enjoyed several days in the 60’s and 70’s, change came like it often does. After 4 solid, I mean solid days of rain, it was coming to an end Thursday night. 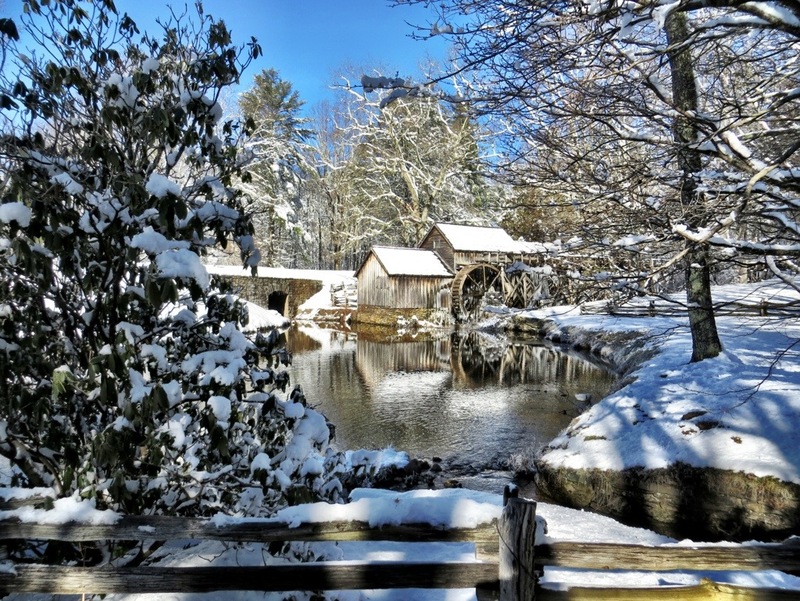 However, some arctic air slipped in with just enough time to cover most of the triad with a cover of snow ranging from a dusting to 4 inches. 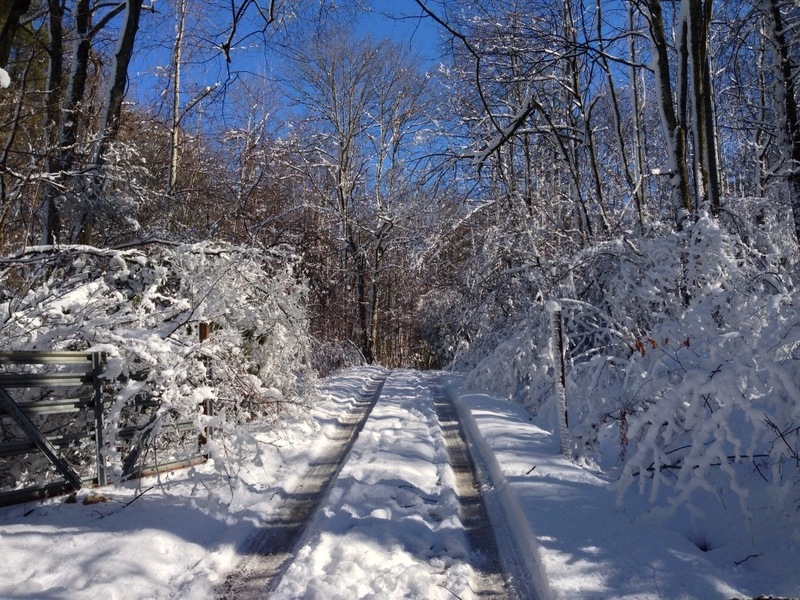 It was our first snow this winter and excitement was widespread. Saturday morning came, the sun was back out and I wanted to go somewhere. 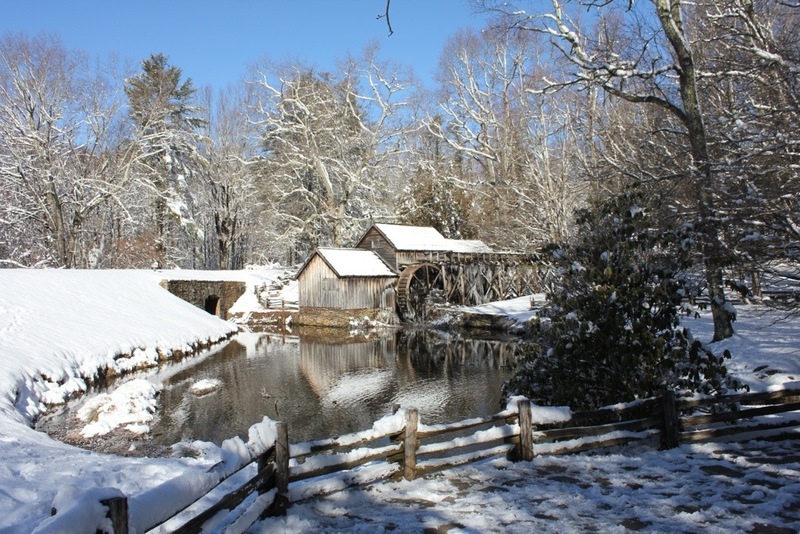 I decided a short trip to Mabry Mill in southern Virginia would be a nice as I had to get back early for other commitments. 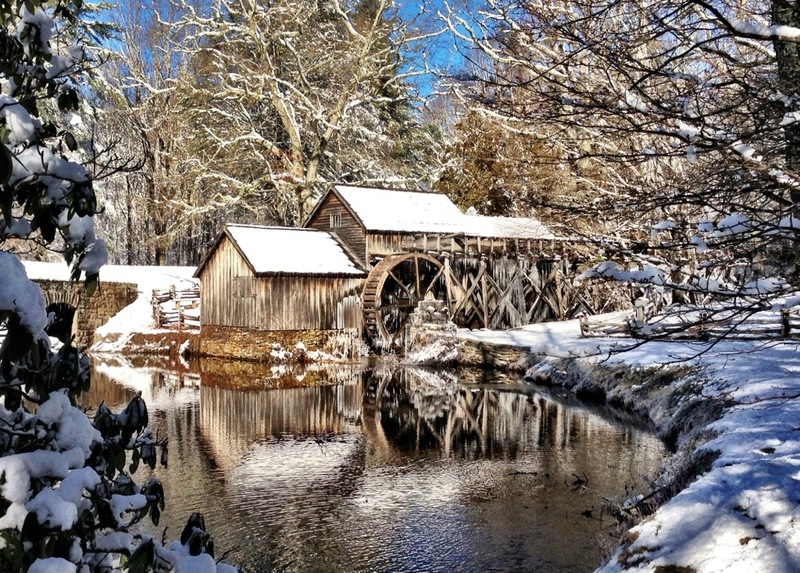 Mabry Mill in Virginia is a beautifully restored historical mill site along the Blue Ridge Parkway. I was seeing this place in my mind with just a little snow on it and a big smile came accross my face. Off we went. As we headed north along US 52 however, the snow was becoming more and more intermittent along side the road. Just past Pilot Mountain, the snow was gone. This was odd, as snow usually falls up here and misses us in the triad. Just as we passed the Virginia state line, still snow free, US 52 begins to climb. About halfway up the mountain, the snow began reappearing rapidly. By the time we reached the top, we were in the middle of a winter wonderland covered in 6-10 inches of fresh snow. The highways had been plowed thankfully, so travel was still safe. When I got to the BRP, we had a decision to make. 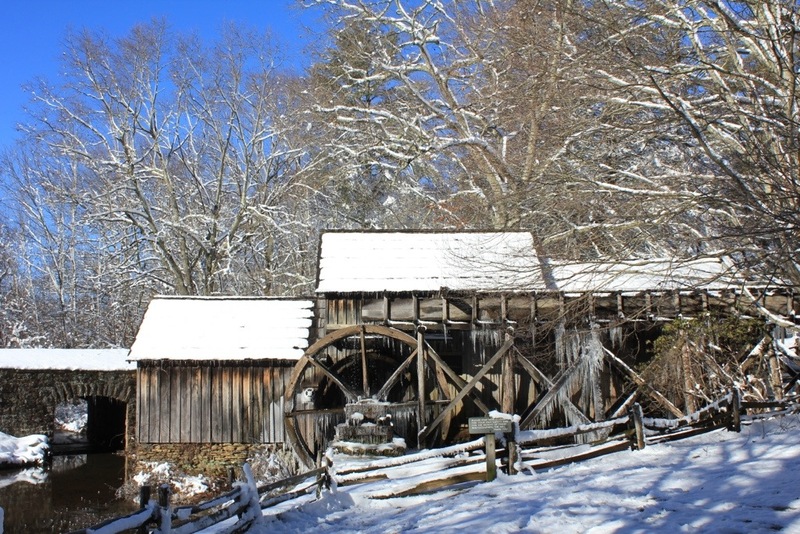 Mabry Mill was just a mile down the road, but the BRP is a National Park and does not get plowed. 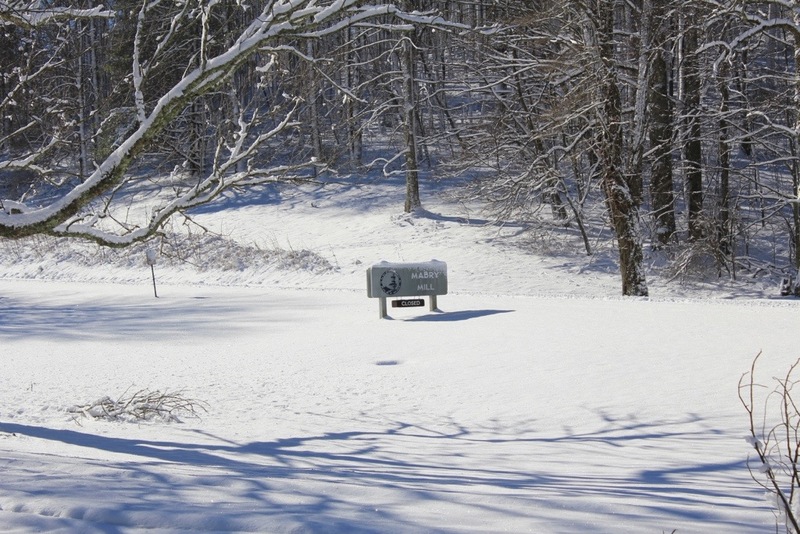 It is often closed in places in winter. Having been here several times already, I knew the grade was not steep through here and the snow on the road was packed, so I took a chance. Boy, was I rewarded! The views this day were far better than I had imagined. The snow was deep, fresh, and untouched. The sky was a deep and dark blue. Few people will see this beautiful place like this. I was blessed. After a half hour in the snow, the coffee in nearby Meadows of Dan was especially good on this chilly day. 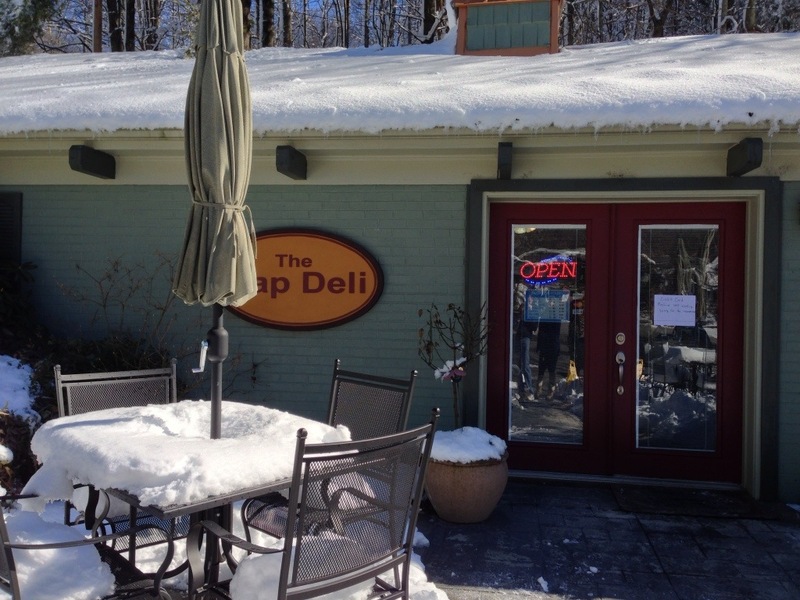 Soon after, we had to head home, but we stopped at Fancy Gap for lunch. 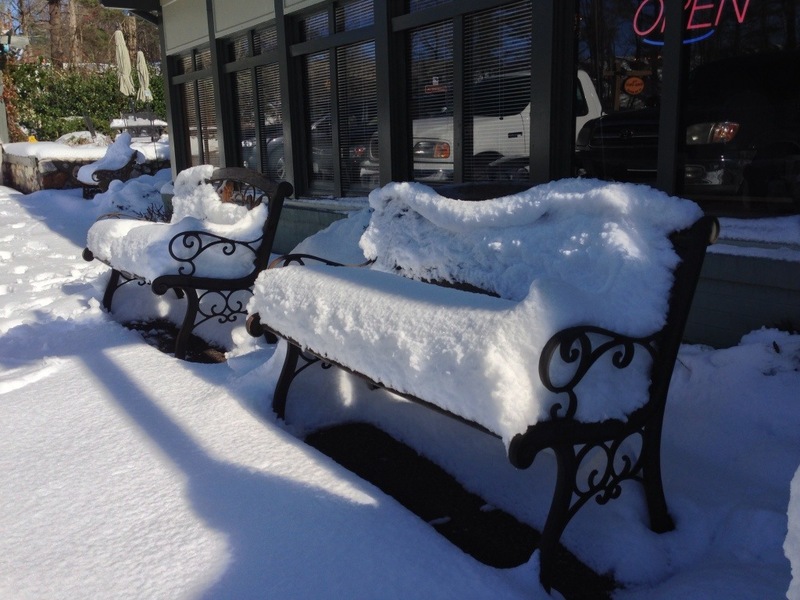 The benches in the pictures below show just how deep this was. After that, our magical morning was over and the snow was soon a memory!! 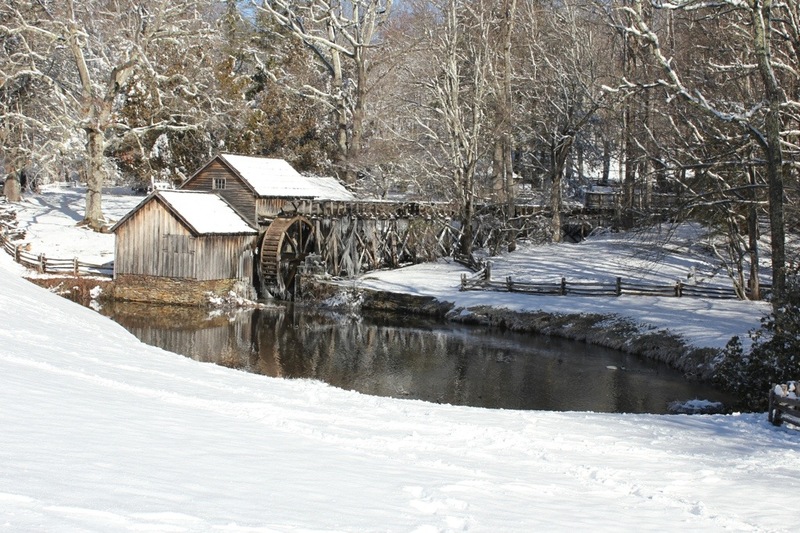 I drove up to Mabry Mill the weekend after you did, and I got much the same pictures, but with less snow and more ice. 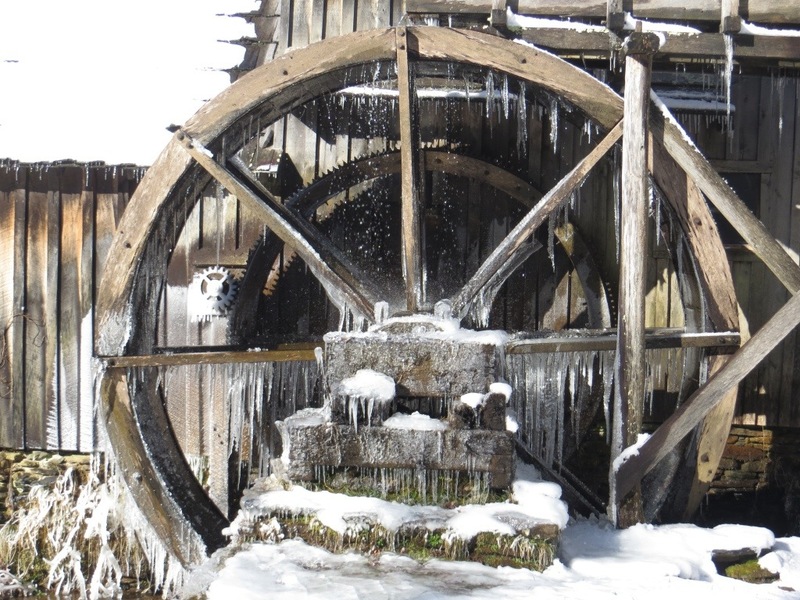 The water that had been flowing off the mill wheel was frozen rather than flowing – added interest to my pictures. I was there early on a Sunday morning, so I had the whole place to myself. 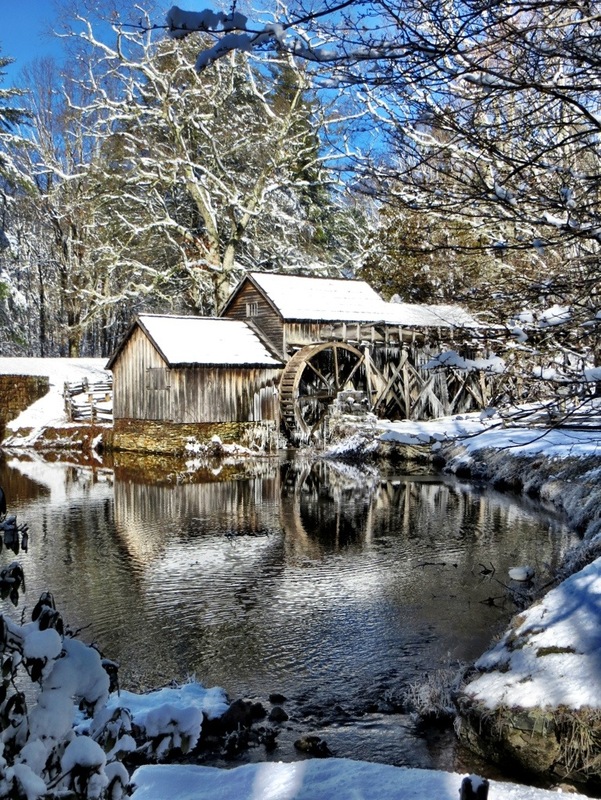 I didn’t linger too long, as I was illegally parked in the middle of the road behind the mill, and the temps were in the low 20’s! 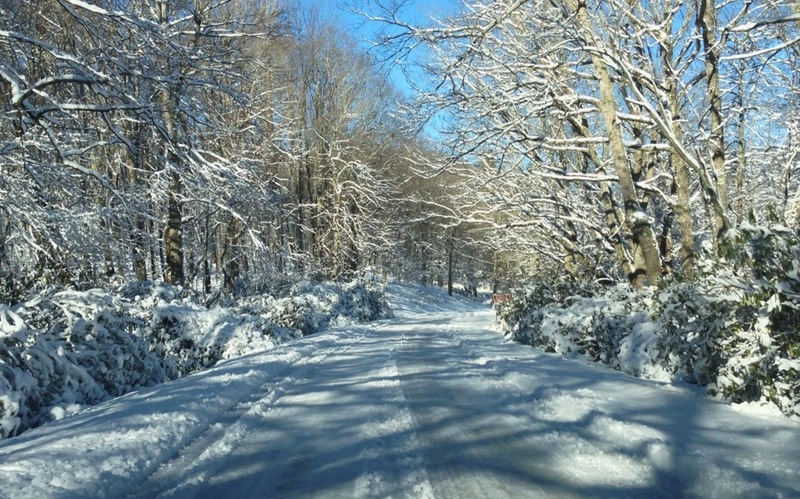 Though parts of the roads were rather treacherous for my lightweight 2WD Blazer, I was glad I went – and glad to get home safely! Check my Facebook for a few of my pictures. I really enjoyed yours! 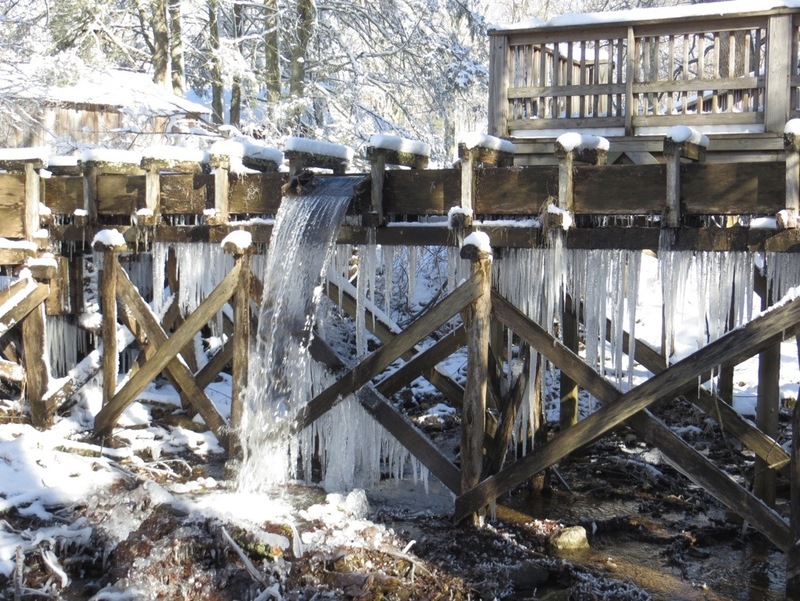 Next Next post: Super Bowl Weekend Skiing & A Waterfall Or Two Of Course!